If you’re any kind of fan of comics, cartoon art, modern American humor (by that I mean post-WWII), absurdity, fine pen work, the better things in life, chicken fat, Little Annie Fanny, and all things Melvin, by all means, get thee to the show. It runs till May 31, 2013, at the Society of Illustrators. That’s on the lovely, tony, trés hah-schwah Upper East Side of Manhattan at 128 East 63rd Street (between Park and Lexington Avenues). Don’t be a schmuck. Make the show. Whattaya, meshuggeneh? 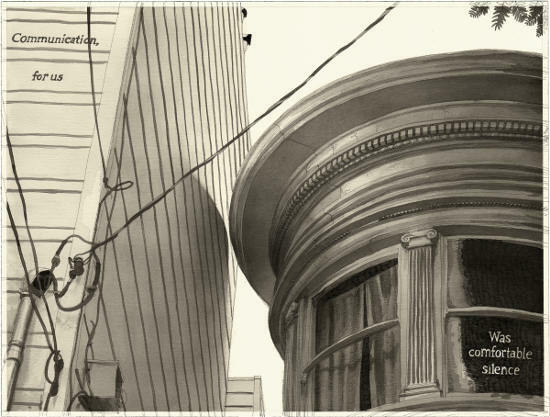 I picked up Paul Madonna’s All Over Coffee a couple years back during a visit to San Francisco. Bought it at the fabled City Lights Bookstore in fact, right there on Columbus Avenue in North Beach. Historic store, historic neighborhood. Madonna’s brush and pen and ink work is revelatory. I’ve never seen anyone capture both the subtleties and the power of light so well USING ONLY BLACK AND WHITE FOR PETE’S SAKE. How does he do it? Practice. And a great eye. And practice. He describes his learning process (and much more) in the book. I appreciate an artist who shares his process. It’s both encouraging (because since he wasn’t always that great, there may be hope for us mortals) and enlightening (ahh… so THAT’S how he did it!). This book is a collection of work Paul did for the San Francisco Chronicle. 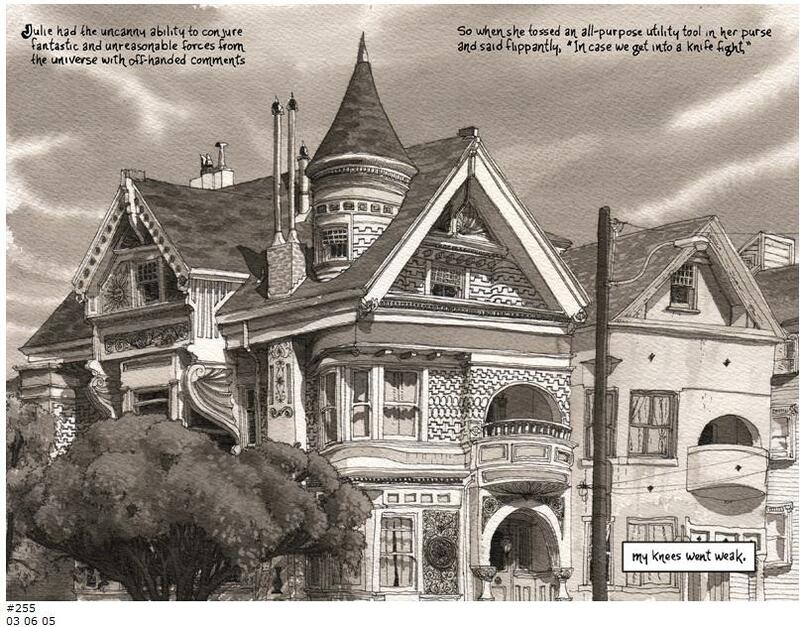 Ostensibly, it’s a comic strip in which disembodied voices provide text to go with gorgeously rendered scenes of San Francisco, arguably the most scenic city in the U.S.
Madonna nails the feeling of San Fran, sometimes with just a clipped view between buildings, or the very top gables of an unmistakeably San Franciscan Edwardian mansion. It’s absolutely uncanny how good he is. All Over Coffee. Check it out. What I’m Reading Now Dept. : MINESHAFT! Where did they go, all those underground comic books of yore? Well, many tanked. But R. Crumb kept it going with Weirdo for a while there. Art Spiegelman had Raw, but that was more artsy. Anyway, we have a new winner: Mineshaft, published by Everett Rand and Gioia Palmieri in North Carolina. They’re up to issue number 27, and from what I’ve seen, they’re getting better and better, featuring old timers like Crumb and newer masters like Christoph Mueller and Nina Bunjevac. Each issue is surprising and deep and worthwhile and nourishing. Check it out. 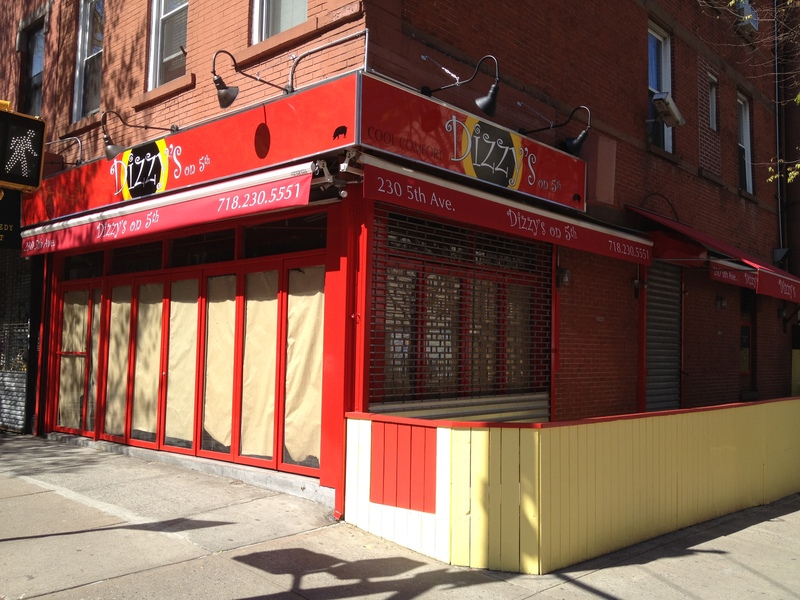 It could be the bacon or the inviting open doors that draws one first into the new Dizzy’s Diner on the corner of President St. and Park Slope’s bustling 5th Ave. 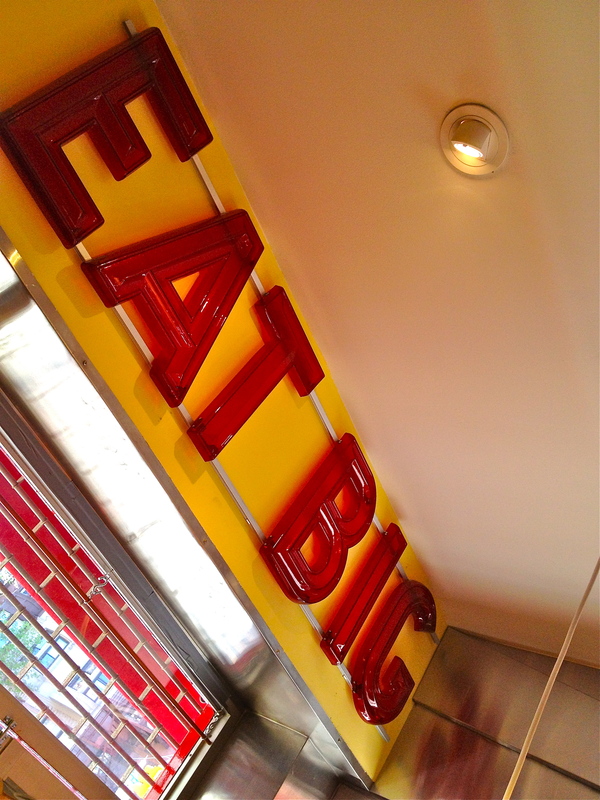 But once inside, the bold poster-style art that screams from the walls is the big star. familiar. In the powerful illustrated montage, 1978, there is the full white-toothed smile and solid stand-up breasts of Lynda Carter as Wonder Woman, power bracelets braced and ready. There is Steve Martin, mouth and eyes open wide, an arrow through his head. There is Cap’n Crunch and the Play-Do primary-colored O-faced grin of Mr. Bill. There too are the gun-toting feather-haired girls of Charlie’s Angels, the Grease logo and John Belushi’s mug atop a “College” sweatshirt. There they all are and there we are, those of us who remember, brought back to a comfortable time and place, secure. As a longtime illustrator and packaging designer, Mr. Tebeau clearly understands the power of icons and symbols to motivate emotions and drive people to action. And it has. 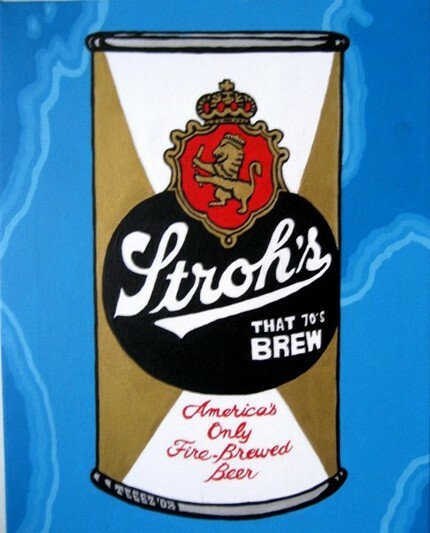 The blue-skinned James Bond depiction, the purple-hued Duke Ellington, the orangey-red rendering of Star Trek’s Uhura, not to mention the Stroh’s beer can, all goose the diner-goer to stop mid-bite of bacon and reflect on the great motivational power of heroes, superheroes and icons from a certain place and time in history. Time past always seems better, more hopeful somehow. We can see the changes that artists make more easily with hindsight. 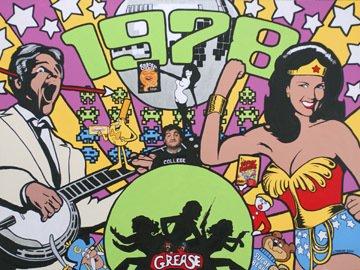 Mr. Tebeau’s work is inspired by artists Peter Max, Wes Wilson and Victor Moscoso whose bold posters reflected what he calls the “joyous optimism” of San Francisco in the fast-changing ‘60s and ‘70s. By hearkening back to that time, Mr. Tebeau well captures that optimism and the necessity of bringing it back again. “It’s easy to get distracted in life, especially the way it is now, with a lot of stimulus and not all of it good,” he said. For Mr. Tebeau personally and, he believes, universally, images and icons offer up necessary inspiration and focus to drive one’s intended life work. As the regulated work world morphs more and more into unstructured freelance, necessitating greater self-motivation, Mr. Tebeau’s suggestion is actually faith-based: we need to trust and believe in a fair bit of divine intervention. 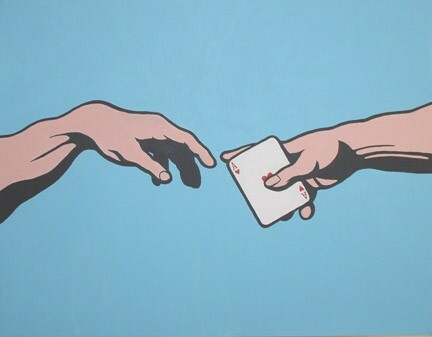 In Universe, Mr. Tebeau reflects the hand of God offering Adam an Ace of Hearts. “It’s about good luck and love and the divine, about the unlikely opportunities and interventions that can come into your life that you need to seize and claim, that can help motivate you,” he said. It is reflective of Mr. Tebeau’s own great joyous optimism that he believes this can happen to people, to anyone. “If you focus on a vision of what you want, you can bring it to yourself, draw it to you…” he said. 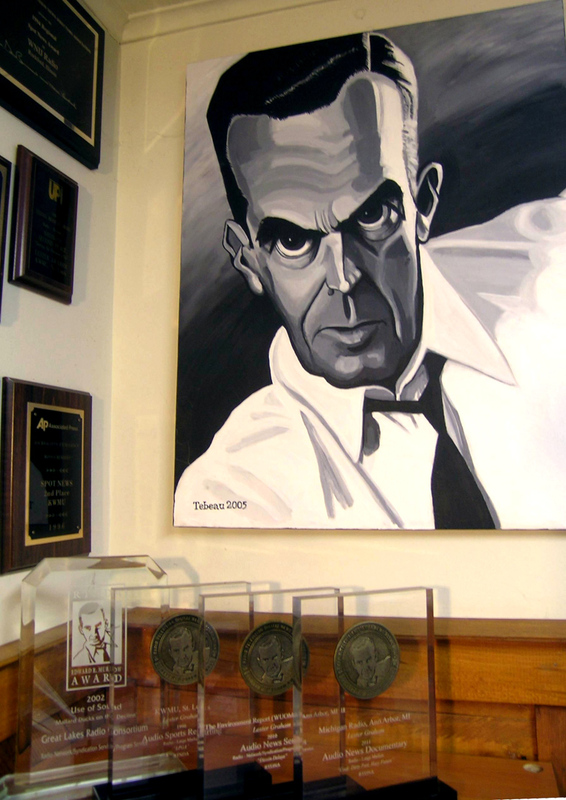 work space, the man went on to win three Edward R. Murrow awards. Mr. Tebeau is commissioned for such work but also wants to inspire more widely with his images. “Art doesn’t work if no one sees it,” Mr. Tebeau says, grateful extending thanks to Dizzy’s owner Matheo Pisciotta and his wife, Mary Fraioli. The couple works with Park Slope-based art curating service Radar Curatorial to set up shows featuring local artists like Mr. Tebeau every three months at the new location on 5th Ave. as well as on the original location at 9th St. and 8th Ave.
“We have such amazing talent in Brooklyn, it’s great to support them,” Ms. Fraioli said. Her husband agrees. “I say, ‘Buy art, save lives.’” Is the saving just of the starving artists, or is it ourselves, that is the question. The couple has featured the art and music of staff as well as that of friends and neighbors since they first opened their doors in 1997, among those they gave their start the now well-renown photographer Lori Berkowitz. 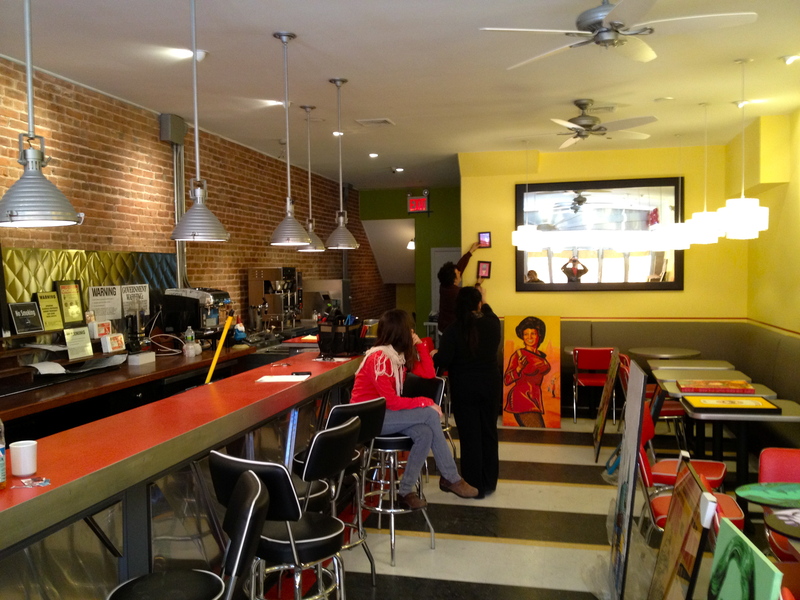 More recently, they formalized the effort by hiring Michele Jaslow and Spring Hofeldt of Radar and offering wait-staff a 5% commission for any art they sell. Visit Dizzy’s for the bacon, for sure, but think of buying some salve for the soul as well. When you feel like you know a cartoon character, not just due to solid dialogue, but also due to little, visual things, like the way they hold their cigarette and shift their weight with their moods, then the cartoonist has done his job well. The cartoonist has transcended the medium of paper and pen and ink and created somebody bordering on real and meaningful. Jaime Hernandez has been doing that for years in “Love and Rockets,” and I’ve only recently been learning about him, thanks to this book. Author Todd Hignite does an admirable job of fleshing out both Jaime and his recurring characters that will please longtime readers (and lookers… reader-lookers. This is comics, after all) as well as newbies like me. It came out a couple of years ago, published by the folks at Abrams Comicarts, but it’s new to me. I picked this up at the good old Brooklyn Public Library (a tip o’ the cap to Andrew Carnegie, my favorite plutocrat), and have just been digging the bejesus out of it. 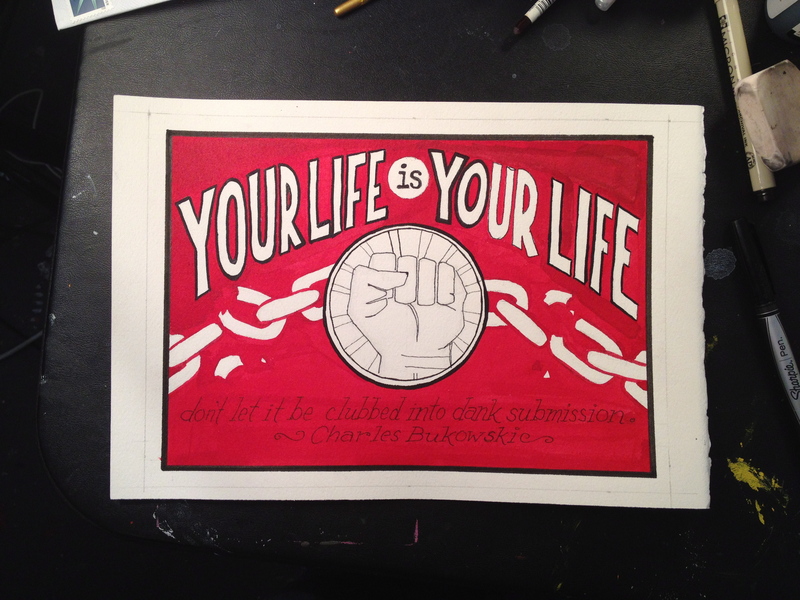 It makes me want to do better work, and devote more time to art. 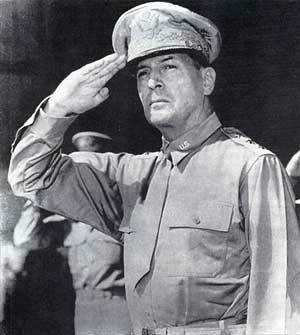 Thank you Mr. Hignite, and thank you Mr. Hernandez. Nice work, gentlemen. Thanks for all the libarries! A quick note here: legendary illustrator and caricaturist Drew Friedman is featured in an art show at the Scott Eder Gallery in Brooklyn, with an opening next week. DREW FRIEDMAN, you guys! 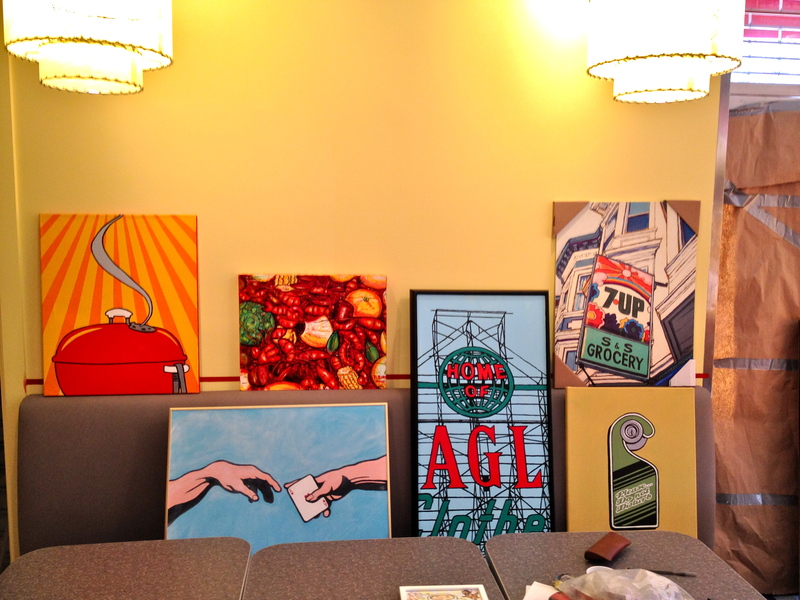 Opening reception is April 27. Be there! I won’t be, for the love of Pete. I’ll be in New Orleans. Dang it. Make No Mistake. You WILL. I think I got that right. Or maybe it’s come for the PAINTINGS and stay for the hash. The hash (corned beef, not you know, Turkish) is damn good. Really damn good. (Yes, I have to swear.) House-made, the meat all shreddy and complex, the taters and onions a little crispy n caramelized from the grill. Best I’ve had in NYC, ever. Okay, I digress. 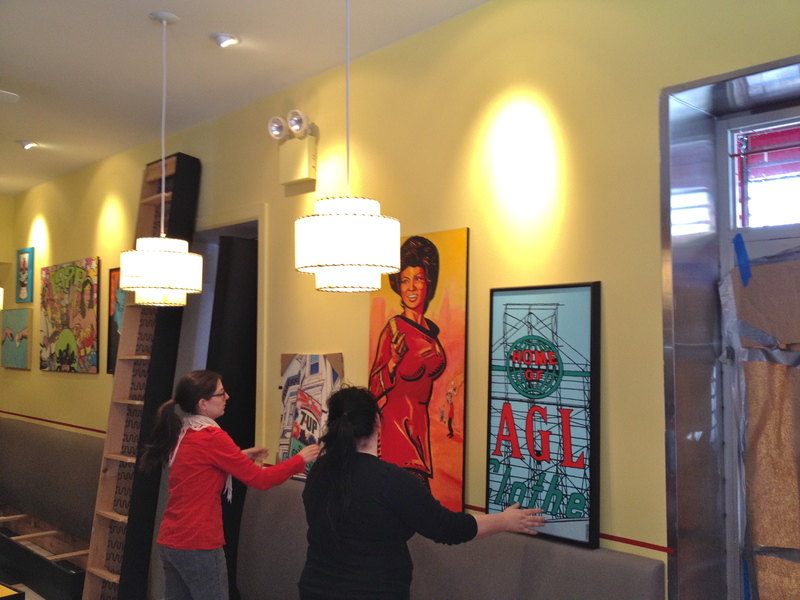 The point is, with the help of Spring and Michele of Radar Curatorial, I’ve got a show hanging for at least the next four months at the new Dizzy’s (the FINER diner) in Park Slope, corner of Fifth Ave. and President St. The place looks great, too. 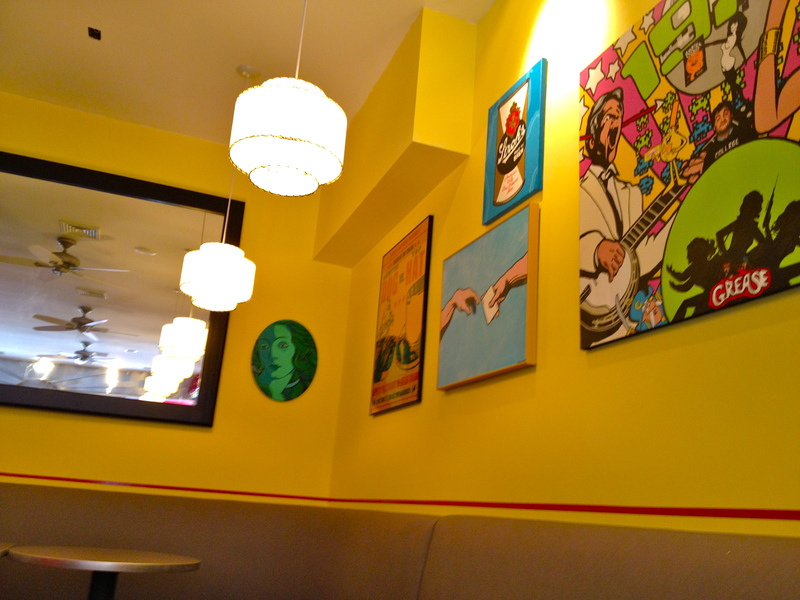 The walls are a warm yellow (couldn’t be better for these particular paintings), and Matheo and Mary have installed a long diner-counter-style formica bar that would make George Bailey himself swell with pride, while Archie and Betty and Veronica watched Jughead go into a food coma after his thirteenth bacon (it’s BROOKLYN!) double cheeseburger as Norman Rockwell painted the whole damn scene. Oh, and Don Draper is in the corner booth, smoking a Lucky and grimly slurping Grandad on the rocks. Wait. That was Freddy’s drink. Never mind. You know. If you don’t, don’t ask. Freddy had problems. But anyway, the restaurant opens this weekend, and on an upcoming Thursday (yeah, you’ll be notified) Matheo and Mary will cook up a dynamite prix-fix menu for a night to stop by and check out the art. I’ll be there… in the corner booth with Don. NO! Kidding. I’m KIDDING. Come ON. Not there. Not with him. Not never. I’ll be at Dizzy’s on 5th, though, probably wearing my Rydell High varsity jacket and saying stuff like “swell” and “so’s your old man.” Will I rebuckle my knickerbockers BELOW THE KNEE? Will I be telling JOKES from “CAP’N BILLY’S WHIZ BAG?” That remains to be seen. Be there or be square, all reet? 23-skiddoo, daddios. Note the outdoor seating area. Yeah? Like that? Yeah! Hard to think of Hemingway now and not conjure up how Woody Allen had him portrayed in Midnight in Paris. That doesn’t detract, though, it just distracts. He said some wise things, many involving work. 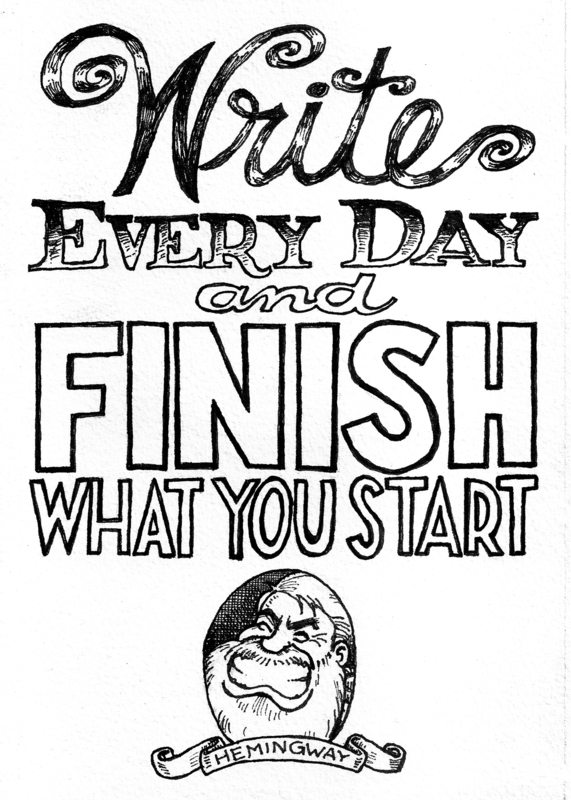 On how to write, he is reported to have said, “Write every day and finish what you start.” Substitute a different verb for “write” and it can be applied to any endeavor. Good advice, sir. Give that man an illustrated quotation. I’m in the back row of a classroom. I think it’s an art class. A phrase pops, fully formed, into my head. I know it’s important, so I grab the first thing I can and I write it down. I use a charcoal stick and write on a piece of driftwood. Then I wake up. Then I write it down for real. Later I cut and sand and prime a piece of masonite board and go to Lowe’s with Sorgatz and buy wood to build a frame, which I stain and finish. Then I paint the board with gold and black paints, complete with an absurdly detailed border. And I hang the whole thing above my desk at the studio. 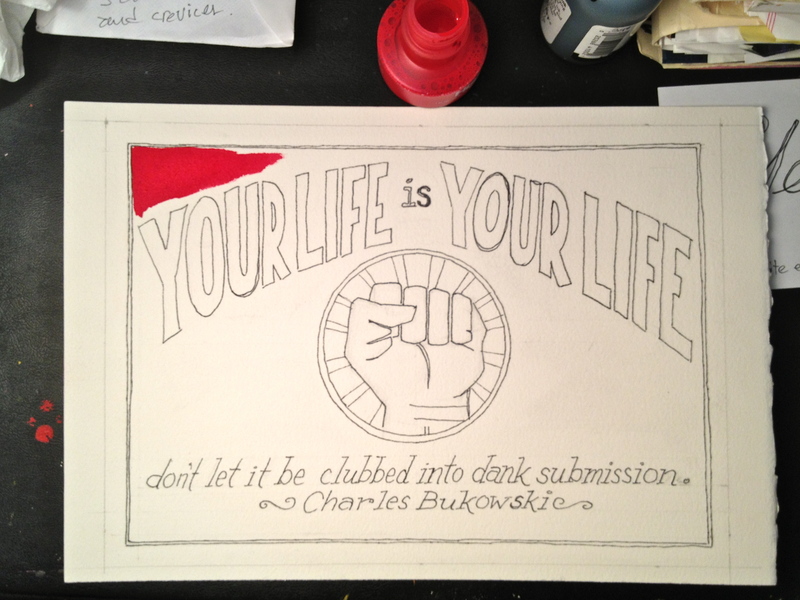 Your Life is YOUR Life…. REMEMBER THAT. Serendipity strikes again, and while I was dithering as to what quote to use for my first piece for The Quote Project, Mark Braun posted a video of Tom Waits reading a poem by Bukowski. That’s like peanut butter and chocolate: it works. 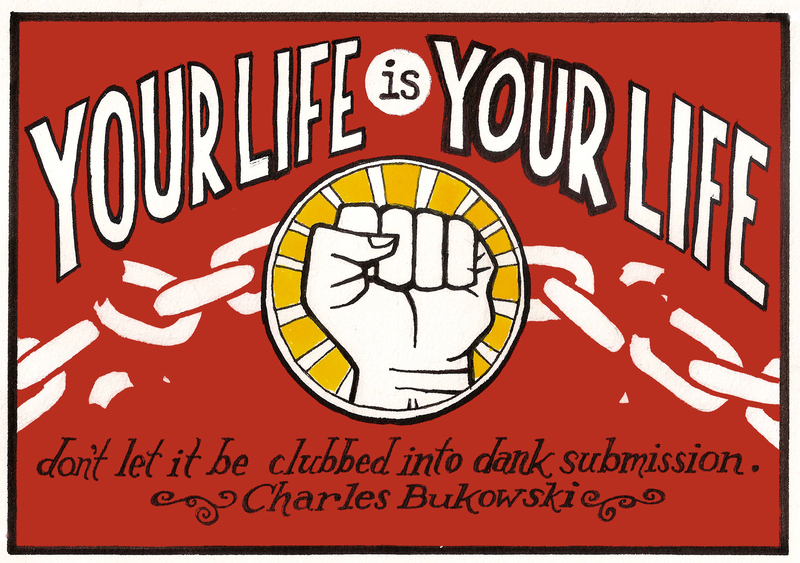 Waits’ voice and Bukowski’s sentiments. A fitting combo. Like gravel and sand and fly ash and slag making concrete. Rough ingredients mix together to create a strong result. So I pulled the first line to make my first piece. I wanted to make it pretty quickly, as it was a busy week. The idea was to get the job done. And the inspiration. Take it away, Tom!